New year, fresh start! I am so happy to say that my blog finally has its own domain name - my web address is now www.awaywiththefairiesblog.com and I am SO excited about it! I've wanted to get a domain name for so long, so I thought 'new year, new blog address' and finally bit the bullet. 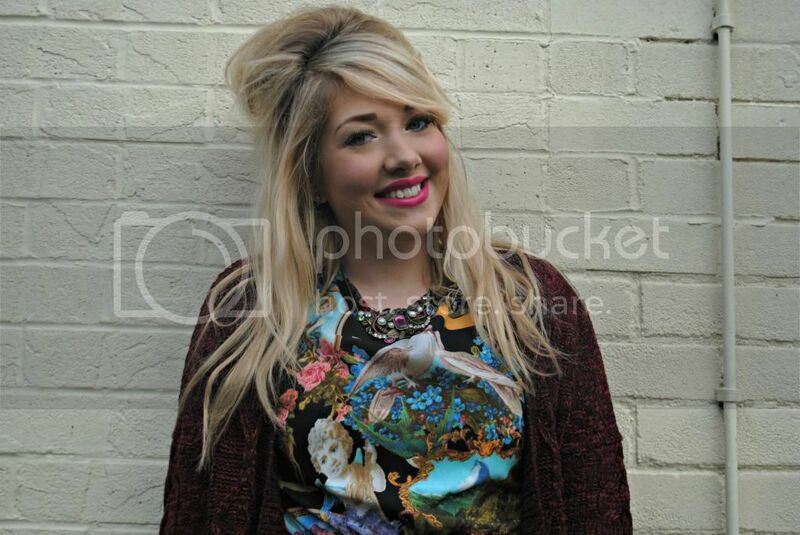 As well as having a new address, I've also ventured into the world of taking outfit photos.... outside. I've been inspired by lots of beautiful bloggers who take their outfit pics outdoors, and I decided I'd give it a go. I tend to struggle a lot taking my photos inside; the lighting is never right, there isn't enough room, and generally things just don't work out. It's amazing what stepping outside can do if you're not a photography whizz - it makes life so much easier. I'm really pleased with how these photos came out, so I think I'm going to stick to taking my pics outside - but I'd like your opinions first! Which do you prefer? Onto the outfit itself - I've had this dress for ages now but I absolutely love it. It's so unique and and I love the cute print on it - cherubs, deer, birds and roses - so sweet! It has a slightly dipped hem which I really like. I was originally going to buy the maxi version but when I saw this baby (in the sale, hoorah!) I had to have it. I wear it all the time, and think it's great to glam up with some heels, although I usually like to wear it with a snug cardigan on days like today! I hope everyone is having a great new year so far!